Summary: Due to its diversity, fragmentation and inherently consumer-driven nature, the smart home represents one of the most challenging but potentially rewarding market opportunities in the history the high-tech area. 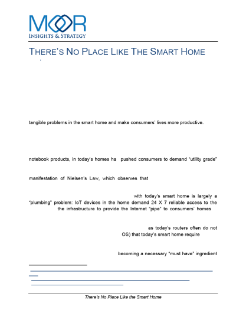 While the global unit and revenue size of the smart home market is large and is expected to grow at an accelerated rate over the next several years, the severe multi-player nature ...of the category will not likely yield one or two dominant winners, but numerous companies who solve specific tangible problems in the smart home and make consumer's lives more productive. Connectivity trends in the consumer broadband segment have created a welcome atmosphere for aspiring smart home users. Fixed broadband subscribers have grown in the United States. The proliferation of Internet-connect mobile and IoT devices, as well as legacy desktop and notebook products, in today's homes have pushed consumers to demand "utility grade" bandwidth (with accompanying robust security) that apps and smart home services require for an exceptional consumer experience.